Today is the day. The Starbucks on 31st and 7th Avenue is the last Starbucks I’ve yet to visit in Manhattan. This is the 20th Starbucks I’ve rated in the month of December and the 208th I’ve rated in 2013. Whoa. It’s been quite a ride. But I’ll reflect more on that tomorrow. For now I still need to spill the T on this Midtown Starbucks. Surprisingly, there’s not much dirt to dish. 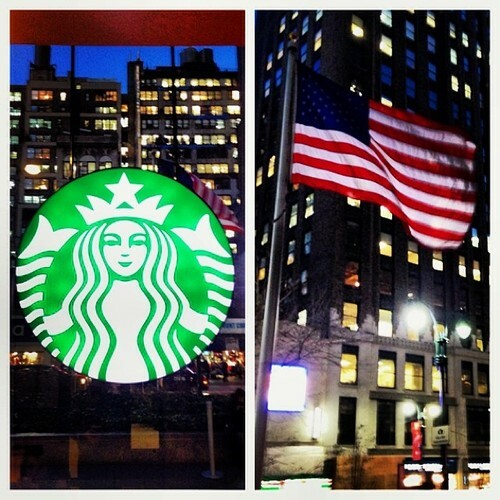 This is one of the few impressive Starbucks in the heart of Midtown, Manhattan. This Starbucks is neither cramped, narrow nor closet-like. It actually has a large downstairs lobby and plenty of additional seating in its upstairs seating loft. Besides the typical coffee pictures on the walls, there is plenty of unique decor such a mural of gears and NYC public transportation near the front entrance. There’s even giant coffee bags resting atop the shelves of Starbucks merchandise. One of the baristas informed me the Starbucks was remodeled just a few years ago, so I have to assume that is when all this nifty decor arrived. On the negative side, this Starbucks does attract a pretty hefty crowd. I had a momentary wait before I could sit upstairs and some have come and left without finding a seat at all. Also, the once available upstairs power outlets have been covered up and the WiFi is a tad on the slow side. So if you’re coming to do some work on your laptop, you may want to bring a full battery and some patience — or possibly a screwdriver. The lighting is also slightly on the dim side, but I think that’s part of the design theme. So there you have it. That’s the Starbucks on 31st and 7th in a nutshell. See more details below, and check back tomorrow for my final reflection on Starbucks, blogging and this great city called New York. Just a stone’s throw away from Macy’s Herald Square — in the thick of Penn Station traffic — is a the small Starbucks at the base of the towering skyscraper of 1 Penn Plaza. It’s semi-removed from the street and a few yards from the exterior plaza on the corner of 8th avenue. 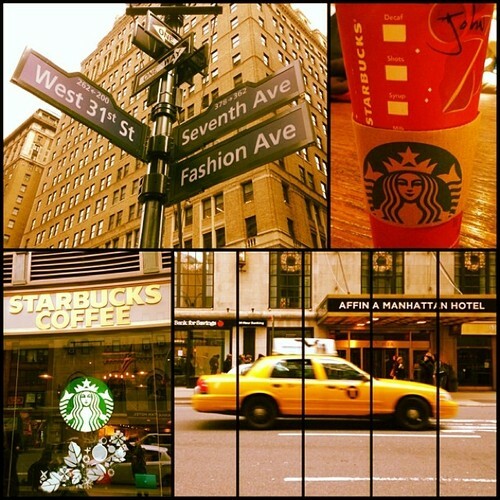 Technically, this Starbucks is neither on 7th or 8th ave, but I eye-balled it closer to 8th. Although this Starbucks looks like it has the potential to be quite sizable from the outside — with its long window paneled exterior — it’s really just a trick of the eye. This Starbucks is another small shallow shotgun style store. There’s a few stools lining the glass walls and an entrance into the office space of 1 Penn Plaza, but that’s nearly it. No restroom, no distinct seating area, and no need to hang around for longer than you need to. 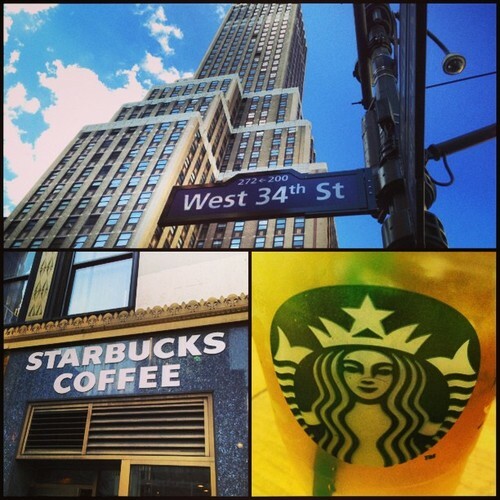 I’ve decided to continue my July theme of Starbucks within renowned NYC landmarks. 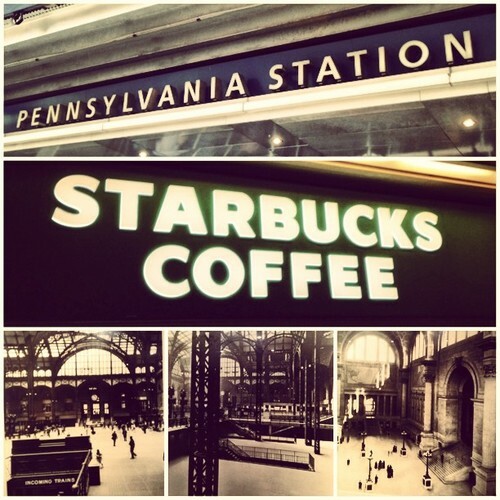 Today my journey takes me to one of the two Starbucks inside of Pennsylvania Station (aka Penn Station). Although deep within Penn Station near the Long Island Railroad departure tracks, this Starbucks’ closest cross street is 33rd and 8th avenue. Penn Station takes up an entire city block from 31st to 33rd between 7th and 8th avenues; and although it is not as big as Grand Central Terminal — and not nearly as nice to look at — it still burdens quite the crowd (twice that of GCT). In fact — talks have long been in the works about how to redesign, restructure or simply relocate either Penn Station or Madison Square Garden to ease the nightmarish crowds. Although, as far as I know, nothing has been decided on. Besides, this building is over 100 years old, so it’s got deep roots. Above you can see some black and white photography from the early 1900s that are hanging on the walls of this Starbucks. Speaking of — after spending the weekend with family in small-town New Jersey (the reason I’m in Penn Station in the first place), it was great to climb up out from the train tracks and lay eyes on that familiar green shrouded siren right here in the station. This Starbucks may not be the easiest to get to for the average New Yorker, but I’ sure it has been a godsend to many a tired traveler. This is a fully functional Starbucks — with distinct floor tiles, lighting, music and decor. All it’s lacking is a restroom. However, that’s not much of a flaw, since most patrons seem to take their coffee to go. Yet, the wooden benches used for seating certainly aren’t vacant –not when they have built in outlets for power-starved iPhone addicts and WiFi for those waiting on a train. All in all, if you were to ignore the fast moving crowds with luggage outside the entrance, this would appear to be your average NYC Starbucks.